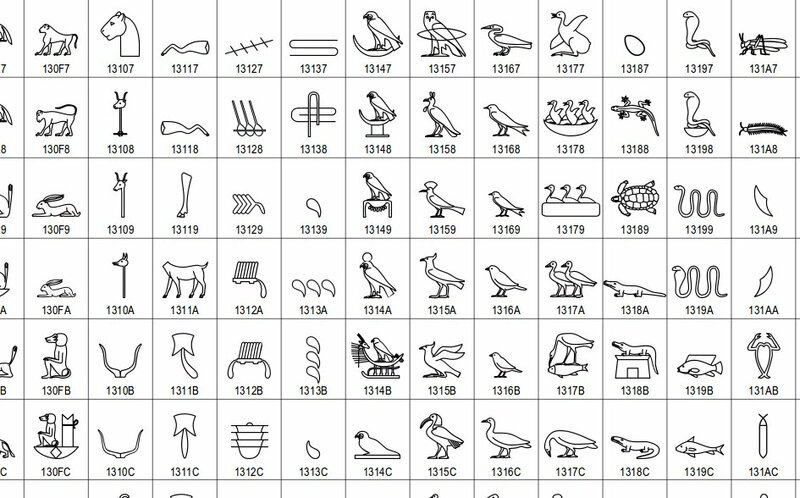 Unicode pioneer Michael Suignard has submitted a "Revised draft for the encoding of an extended Egyptian Hieroglyphs repertoire" in Unicode, trying to replicate the expressivity of the 7,000 hieroglyphs used in Greco/Roman times. His taxonomy includes over 2,000 awesome, well-sorted glyphs, including the all-important "phallus" and "liquid issuing from phallus". This document does not pretend to describe in detail the various complexities of the extended Egyptian Hieroglyphs and its usage. There are many publications on that subject, a bibliographic references section may be extended in a future version of this document.A previous document: [L2/16-257] established the base for the encoding model. The taxonomy is based on the [IFAO] classification (Institut Français d’Archéologie Orientale du Caire), roughly based on the same large groups than the Gardiner classification but with a secondary level allowing finer and more manageable grouping. Thus, a database has been created with all Hieroglyphica glyphs/characters, along with added hieroglyphs through the study of references.While some of the proposed elements could be considered ‘quadrat’ structures, the emphasis of the proposal is to encode‘atomic’ characters, i.e. characters that cannot be easily rendered as discrete elements because it involves ink collision and complex reshaping of the components.